The fur on the Ragnar model is better. That is some of the nicest space wolf gear I've seen in a long time. Its a really strong space - vikings theme. Also, I really like the paintjobs on these particular pieces. I love how the axes don’t look ludicrously large. I love that upgrade kit. the chest armour is superb. will definetly be getting one of them. Those are surprisingly okay, the leather masks look a bit goofy IMHO though. Those are some lovely bitz though. I like the masks. One of them looks like there's a braid hanging out of his mouth though. Those are awesome! Some of the best Space Wolves stuff IMO, I love the shields! Anyone else notice the gun has no grip on the Praetor's hand? Similar to the chainsword that looks like they've glued the top and bottom onto a fist. Shh..they were hoping no one would notice. So I really do like those shields.. but the axe.. why would you place a wolf head above the blade? To me it seems that would prevent the blade from doing it's job. Maybe I'm wrong on that, but to me it feels like a blade below the head of a mace makes no sense. But then I'm not a Space Wolf player and may not understand all their Wolfy secret weapon stuff. Yeah, the way they sculpt chainswords, with a single row of hooked teeth each two fingers wide and tall, would not work in the slightest, not least because of the adverse torque. Even Frostfang and similar blades with triangular teeth have severe issues but at least this you could claim are actually two counter-rotating sets that just happen to have been caught in perfect alignment (or ‘park’ in that position when the blade is deactivated). instead of leather hats it should've been like the helmet from Skyrim. The leather masks feature prominently in the HH novels I've seen which include Space Wolves so I guess they felt compelled to make some. Chain swords are a good case in point - they are an absolutely ridiculous weapon. A sword is primarily a stabbing weapon, but if you ignore that you are still left with what is basically a chain saw, not the ideal weapon for hacking through an opponent when you have power swords. Still, all in the name of grimdark eh? Chain swords are a good case in point - they are an absolutely ridiculous weapon. A sword is primarily a stabbing weapon, but if you ignore that you are still left with what is basically and chain saw, not the ideal weapon for hacking through an opponent when you have power swords. I completely disagree with your statement that a sword is primarily a stabbing weapon, but totally agree that chainswords are ridiculous. That’s part of their charm. A sword is primarily a stabbing weapon. Not really. It depends on the sword use. Sabres are primarily slashing weapons, long swords can be used for both, rapiers are primarily thrusting, etc. Eh, I can see chainswords being useful against targets with dense / tough flesh. Stabbing is only good if the blow hits deep enough to hit a vital organ, and slashing is only good if the strike can cause mass bleeding, maiming or manage to bite hard enough in to high something precious. If you're dealing with something that has tough flesh, then stabs might not pierce deep enough and slashes might not cause sufficient damage. Power swords aren't really a logistically solution, because those are expensive and need a strong power source, iirc. Cheaper to make a chainsaw in sword form, which can just grind through that tough flesh and cause severe physiological damage. Indeed. I’ve often wondered if powerswords are as impractical as say lightsabers, in that you can’t grasp them by the blade and use halfsword techniques. Indeed, and at each end of the spectrum you have small swords, which have no blade and cannot cut at all, and early falchions, which basically cannot stab (Elmsley type 1). Some smithing group made a huge Blood Angels chainsword out of a converted chainsaw. It was too heavy to be wielded by a normal human, but it actually cut remarkably well (and quickly). Considering how it was constructed, it was also more resilient than I expected. I don't think chainswords are as impractical as they appear within the context of advanced tech, and crazy tough aliens as you point out. A saber is gonna struggle to incapacitate an ork. A purpose designed chainsaw, with an adequate power source, would probably be reasonably useful for a superhuman in half a ton of strength-assisting armour to anchor them. Is there much need? My understanding is that half-swording is primarily useful in fighting armoured opponents, where you cannot rely on the point and blade to wound the opponent, and need to essentially grapple the opponent into submission and precisely target weak points. To this end, the sword functions like a pointy crowbar. Power swords negate much of the effect of armour, so the need for half-swording is reduced. Having said this, it depends on which bit of fluff you read- some seem to have the disruption field as an energy field vapourising stuff that touches the blade, but other fluff describes it more like an aura that basically softens stuff before the blade carves through it. The latter may be possible to grip with the precision Marines have. 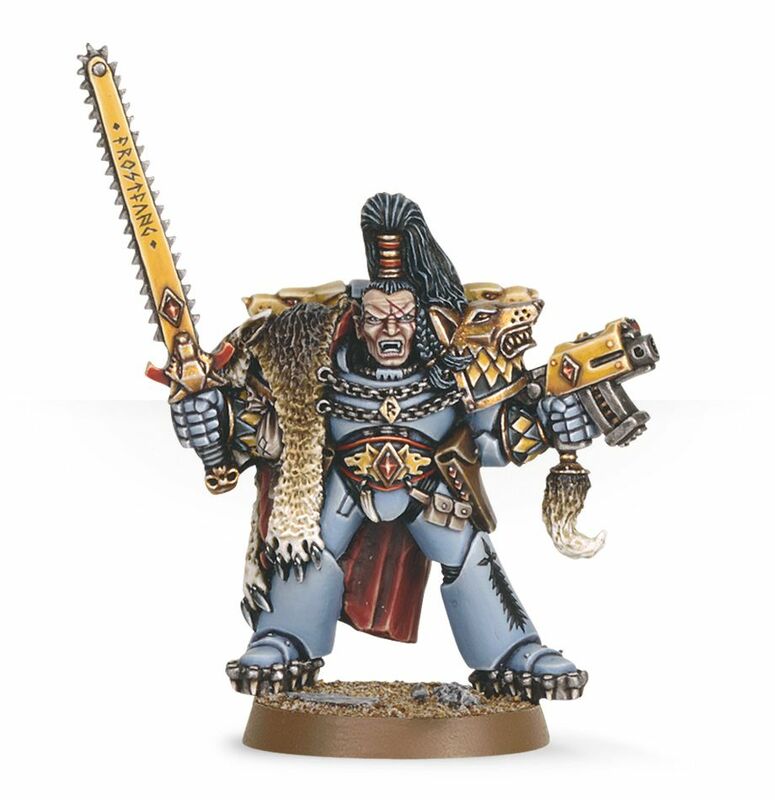 The 30K spacewolf aestetic really is on another level than the 40K one. More or less everyone of those bare heads look appealing while I've seen maybe 3-4 heads ever from the multitudes of 40K SW's that doesn't look ridiculous. I wonder if FW will start selling the Custodes Contemptor body separately once the 40k codex arrives? Huh? Interesting. Weight is no issue as even unarmoured marine is many times stronger than normal human and power armour just makes it even better to the point main point of weapon against say human is longer teach(human would be incapacitated by just sheer impact). Maybe the chainsword impracticality is actually false idea then. Weight is an issue- stength does not negate momentum. Even with infinite strength, if the chainsword is too heavy, the Marine will swing round it somewhat when he tries to swing the saw. Hence why I mentioned that the power armour is very heavy- this counters the weight of the chainsaw and actually would allow a Marine to wield a heavy melee weapon much better. Human chainswords would have to be considerably lighter. I think even with the massively increased strengthof Marines over humans, it would be possible for humans to parry Marine weapon strikes- its a matter of levers. A weak but skilled fencer can block a blow from a very strong fencer because the strike hits at the end of the attacking blade, but near the hilt of the defending blade (if the attack was worth blocking at all). Having said this, there would be a degree of smashing through the block. I doubt this would be incapacitating, but it would be overwhelming against all but the most skilled, hardened humans. When I say durable above, I men the teeth didn't fly off when they sawed wood (which is a lot tougher than flesh and living bone). However, they did not swing the thing into anything. I reckon a chainsword could be practical, but I doubt it would ever be the most practical melee weapon in an era that could produce it. Anybody know how much they are? Jeez. Not to beat a dead horse... but the paintjobs coming out of FW nowadays are just awful. The style is jarring and does no justice to the sculpts. I wish they would get just like a single 'Eavy Metal person to move over and do them. They outsource the paint jobs to a guy who posts on FB quite often, he's Italian I think... he has a very distinct painting style indeed. I like it on some models and not so much on others. Does the guy on the right have a pony tail growing out of his mouth? I think it is meant to be a braided beard, but it does look odd. Maybe the face is gurning? I suspect it will look better in person when you can view it from multiple perspectives and the image isn't blurry. Finally, the New Year’s Open Day saw some very exciting news for Legio Custodes players – rules are on the way for using your models in Warhammer 40,000 alongside the new plastic Adeptus Custodes. Was mentioned on the custodes thread but guess it works here. Now what about reverse? 30k rules for the new units? Terminators, basic armour elite guys and jetbike. Want an excuse to buy them. -Valoris: Use as a tribune. -Awesome bikes: Use instead of awful bikes. Only useless ones are terminators, even then they might be cheaper and a viable conversion base. Elite ones don't show all with weapons. Besides these are way too overblinged to work as standard bike unit. More like elite bikes like Hetareon vs basic custodian squad. And you forgot terminators who again don't match 30k equilavents at all for weapons. If you're saying that the elites don't have alll Hetareon weapons, they still have a visually distinct look, good for converting weapons onto. And they come with a variant poleaxe version of the guardian spear, so there's something for their commonly used paragon blade right there. Both bikes are a rider with a spear and an underslung gun. If you can't swap out an underslung gun on a bike I have nothing to say to you on the matter. And no, I mentioned the terminators. Listed them seperately because they'll obviously be a little extra work and are conditional on being enough of a relative bargain to justify the conversion effort. Swapping gun possible? Yes. EXCEPT THERE'S NO WEAPONS SOLD! What? You expect me to buy FW bike kit AND plastic version and use those weapons on plastic dumping rest of bike? Expensive bikes for sure! For overblinged bikes to be standard bike unit. Guess it works if you are swimming in cash but waaaaay outside my budget. I just keep the FW bikes then and use them. Works better as basic bike unit anyway. I'm ignoring the "overblinged" and "basic bike" comments for Custodes because as little sense as that makes to me it's a subjective issue. The other though... You can't imagine having the parts for fancy variants on heavy Bolters and Lascannons? You can't imagine working something out for the heavy hairdryer death ray? The only expensive part to replace is the heavy hairdryer, a volkite culverin is probably the best replacement. £13.50 from forgeworld for 5. Presuming you only want the death rays, you're sorted there and then. I guarantee the total for 3 bikes is less than £90. Cheaper than FW, you get (mostly) plastic over resin. Never, we few that dislike the book are damned to eternal suffering. Yeah right slap heavy bolters on which then...Look like heavy bolters. GG! And then to add to confusion you would have multiple models on board with clearly different looking weapons with same weapon rules. Maybe you like proxying. I don\t. So you proxy volkite weapons so you have somewhere volkite weapons that are volkites and elsewhere volkite weapons that aren't volkites and somewhere the real gun. Naaah some people don't like proxying and such a confusing where you have volkites as volkites, volkites as death ray and death ray as death ray is way too confusing. Cheaper it might be but also inferior. Quality is sometimes worth paying. It's not like custodians is army you need tons of model so might just as well make sure they are GOOD LOOKING. Plastic ones are yes cheaper but look wise also inferior. 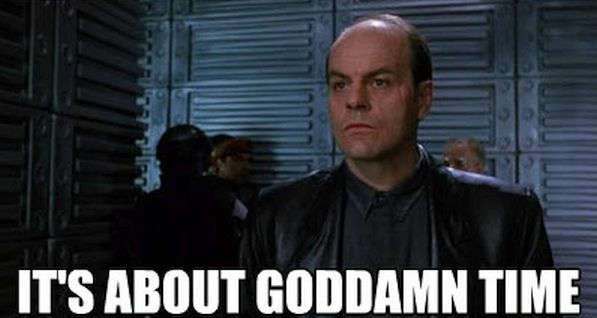 As a person who has literally been waiting years for 40K rules for FW's Mechanicum stuff, I find it hilarious that people are now crying for HH rules for main GW stuff. And yes, they obviously should make such rules, but FW is pretty gak at providing rules for non-marine stuff. Meanwhile, can you guys take just about all of that to a separate thread? See that model is very much in my "would love one but can never justify buying one" pile. Seriously for such a new army Tau got some fantastic models out of forgeworld! Seriously considering the ages you'd expect Tau to have fewer things from FW, yet they've got one of the more diverse ranges. It's also a complete sod in the game. Well, it was in 7th Ed anyway, not sure about 8th. Somebody took one or two of those (I forget how many you could fit into 1k in 7th) along with a Warhound in a 2k doubles tournament at Warhammer world that was ranked by number of best game ratings, needless to say they came nearly last. I'm mostly just bitter that my Ordinatus Phallocannon consistently underperformed in that Apocalypse game. Could I roll a 6? Could I nowt! When someone drops two Supremacy Suits and a Warhound on you, they should also just reach across the table and slap you with their wallet. In an apoc or a full on competitive game I'd have no problems with it. My Ordiantus normally works well against everything but troops, it just doesn't generate enough wounds reliably enough. Stoicly, Abnett churned out another stoicly terrible book of stoicism. Oh crap. That is tempting. But I have 1 shot. This or wait for next week which might or might not be useful for me...ARGH! Oh wow, a FOURTH week with nothing new. Gotta give them a gold medal for slacking. I'm honestly surprised this is all we're seeing. FW doesn't even have some doors or shoulder pads as a filler release? I wonder if this means they've been working on an interesting new project, or if they've just been lazy over the holidays and done zero work. They're re-doing old moulds like the Macharius and Hell Talon. I would guess they are saving stuff back for the HH weekender on the 3rd Feb, which I am really looking forward to go to. Also, an important note for people in the US and Canada: you can enter for free. Under US law prize giveaways like this can not require a purchase to enter, you have to be able to enter for free. In the contest rules there's an email entry option that you can send in if you don't want to buy anything that would qualify. 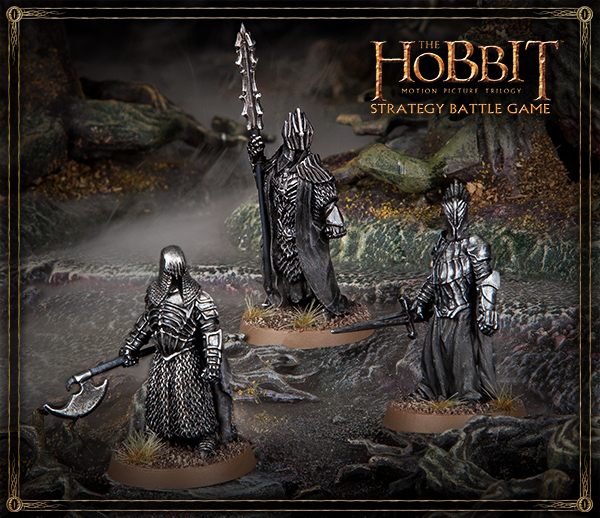 According to the newsletter, The Nazgûl of Dol Guldur are pre-order today. All I see in the T&Cs is : "Countries: Open worldwide excluding USA, Canada, Ireland and Northern Ireland."? (b) send an email to competitions@gwplc.com with the subject line ‘Win a T’au KX139 Ta'unar Supremacy Armour’. The body of the email must include: your full name; your contact telephone number; and your full address. And note that this is not an optional thing for FW to offer. It's illegal to run a giveaway like this in the US and require a purchase to enter. If they want to have it open to US residents they are required to offer a free entry option. So if you ever see a contest in the US without one stated you should contact the company running it and tell them that they are breaking the law and must allow you to enter for free. Bland, lifeless '00s style sculpts. Ick. If I'm right in thinking, that's because a compo that requires a purchase become gambling? I'm sure we've got the same thing in the UK. Or at least used to. Crisp Packet prize draws used to have the 'no purchase necessary, write in and we'll open a bag for you, honest' thing. I like the dude with the axe, but the others are distinctly meh. I wish they separated the competition by region if they're going to apply different criteria to entrants in different places. Doesn't seem like it's worth paying to enter when everyone in the US can get in for free. I'd be shocked if someone from the USA actually wins though! It's not so much that they are giving different criteria; but rather that different governments enforce different criteria depending on the nature of the competition. Also lets be honest its a single prize and even at a slow period I'm sure FW makes quite a good number of sales - ergo free or paid the chances of winning are very slight. I just ordered an Acastus last knight before I knew what it was today. It would be hilarious and awesome if that entry won an Acastus. I'd be OK with that! Does anyone know where they ever post the winners? I don't think I have ever actually heard of anyone winning one of these contests. Apparently Cyraxus is coming out around March, anyone else heard about this? Can you clarify if this is right or not? Someone please confirm this. I find it hard to believe Fires will ever truly be released. When is the next Open day for FW? Anyone know? Haven't heard corroboration myself - but all rumours start with a single one! I'll keep some cashmunneh aside for that badboy. Next FW event is the HH weekender at the start of February. FW have released a IA book at a HH weekender before, I bought IA 13 at one before it went on general sale. However I would guess that would be too early as I can't see FW releasing an IA book featuring Tau before the Tau codex dropped. The next big event that isn't AoS only is Warhammerfest in May, after that FW have an open day in July. So either Forgeworld will release the new IA online when the Tau codex comes out, or they will likely wait till May? Am I just blind or is it impossibly to buy the knight they have in the lottery? Missed that tidbit, hopefully it's true, interesting that the rumoured release schedule has Tau Codex for March, which seems to be more and more likely considering the schedule so far seems to be correct. Releasing Tau first half of March then Fires in the later half would make sense. Eagerness to know more intensifies. Or they are taking a breather, heaven forbid! I really wish they would spend their resources on keeping existing models in production, or reintroduce out of production items. I want them to bring back transfers and etched brass items that's been oop for a while now. I guess FW orders them from one or more suppliers, and once the stock is depleted, they don't make any further orders, which is a shame. They tried to bring transfers in-house, and even hired a designer for them - but they got transferred to other projects. Have they announced any winners yet? Didnt' check on early competition dates but at least last and this week draw will be on same day(90% sure) so maybe they all are drawn and announced on same day? Aaaand guess this means I won't be spending 50£ for my free shipping. That prize is useless for me. So maybe just get Sons of Horus airbrush paint bottles for future. As you can see from the list above, every aspect of the Forge World Studio Design Team will be here at the Horus Heresy & Necromunder Weekender ready to talk about the hobby and pass on any hints and tips to help you with your hobby in 2018! Taking place at The Nottingham Belfry Hotel on Friday 2nd, Saturday 3rd and Sunday 4th February, this sold out event is going to be a great weekend for all fans of Horus Heresy & Necromunda. Do you know if there will be blood bowl too? No Angelus on the schedule means it'll be on sale at the weekender. I'm also betting we will see either another red book on sale or announced. I'm really looking forward to this, I'll be taking my Ultramarines. Anybody else going? You really think it will be on sale? I'm guessing Angelus has been renamed or delayed. I hope they show something in the seminary of necromunda's future. Besides, is there nothing about blood bowl? 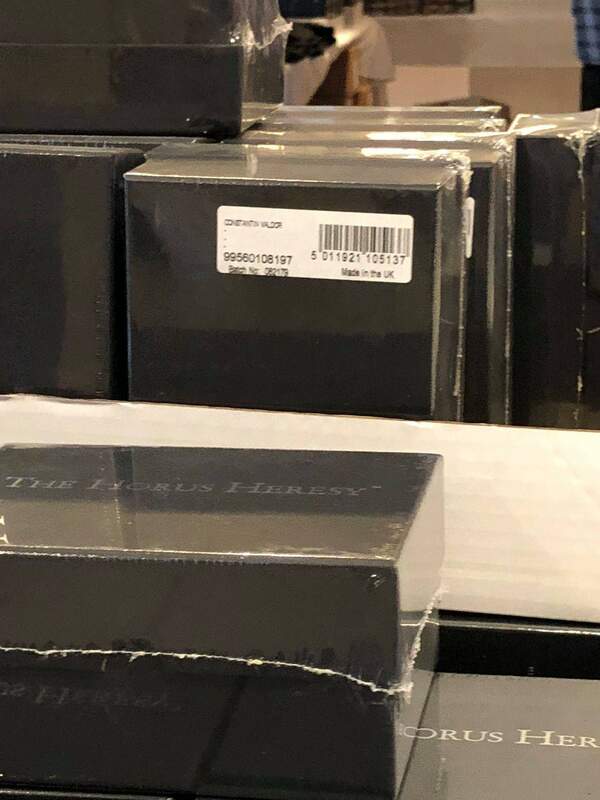 The alternative is that they have no new HH rule book on sale, I just can't see that happening. Angelus is so late (understandable obviously) it has to be ready by now. I can't see them scrapping it as that story needs to be told to progress the BA, outside chance it'll be renamed but I'm doubtful, it would mean they added one or more other Legion and that Legion's story to the book. You'd expect quite a bit of Necromunda at the Heresy and Necromunda weekender to be fair (and probably expect less blood bowl). Uuu getting nervous about the Angelus. With BA as my 2nd force I really want that book. Wish they'd show us the niceness that'll be available on the day. I mean, I'm not going, but I like a drool as much as the next nerd. They seem to be drip feeding a new bit of info each day, so I'm expecting that later this week. Valdor should be available to buy at the weekender as he’ll be shown. This is probably the new table they're building, which features a destroyed Warlord. Well, Titandeath on Beta Garmon was what the (initial) Adeptus Titanicus release game is supposed to be based around. Andy Hoare is at that one - wouldn't that suggest it's a specialist game and therefore AT? Future of Necromunda one will be the one I'm most interested in. I believe the last word regarding Angelus was late 2018. So I highly doubt it's been completed 6-8 months AHEAD of schedule. "Angelus" as a book title doesn't seem to fit the rest of the series, so I'm guessing that "Malevolence" is simply its new title. But as someone said, it's possible the book has been split. Full army lists for BA and DA, plus Dark Mech units/rules, and a port (more or less) of the old Codex: Daemons with FW daemons added...seems like a LOT of rules content. Before Alan's passing Angelus was nearly completed, so that would mean FW wanted another 20 odd months to finish it off rather than 12 months or so that delivering it for this weekend. That seems way off considering how many people they have recruited to the team and based on what they said at the last weekender. There was an entire thread about it here. Honestly, I'm not even confident that they'll hit that date. I'm not sure where you got the 'Angelus was nearly done' thing from, because I haven't heard that anywhere. But of course model development time could be a factor here, and we know that resources are tight at FW with everything going on there. Yeah, Angelus will be pushed back to 2019 if anything, there’s no way it’s ready now. End of this year was what they said. I think Malevolence is probably just Angelus renamed. 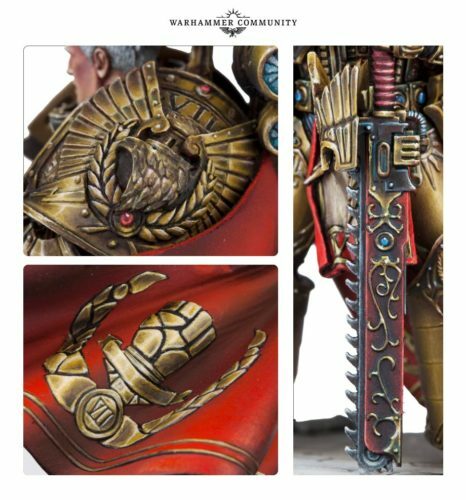 I think everyone is expecting that both Dorn and Valdor will be unveiled. The releases could be slow because they are holding things back at this point to have a big unveiling and drum up some hype. If people know Dorn/Valdor/etc are coming, they will save up a bit and maybe even buy extra. Plus it was the end of the year/start of the new year. Not much going on then. Expect a long list of awesome new stuff to show up this weekend. Hopefully that 'long list' includes Necromunda releases beyond some sketches/photos of the next gang and some bulletpoints about GW3. It is odd we've not had any pre-release teases yet. Wish I was going, but I just can't justify the ticket price. And of course, people snapping up multiples to try to sell on eBay for stupider money. Parasites. As for slowed releases? It makes me wonder if these weeks were originally pencilled in for Adeptus Titanicus prior to it's delays. Pure speculation like, and probably wrong. But it does feel like something is missing. Whether you’re a dedicated Horus Heresy player or you’re just an Imperial Fists fan who’s been itching to get your hands on a Primarch of your own, Rogal Dorn’s arrival is a momentous occasion. You’ll be able to order this guy for your army soon, and if you’re attending the Horus Heresy and Necromunda Weekender, you’ll have the chance to pick him up early. Owww if I wasn't overflowing with projects I would be starting Imperial fists for this! While I would have liked a dynamic pose with Alpharius like Fulgrim/Manos, I still like it. Stoic, feth you this is my goddam wall look on his face. Definitely a competent warrior's 'who's next' pose - reminds me of Kung Fu type movies. It's absolutely perfect (except the abstinence of a mustache). The calm, collected sentinel of Terra. The problem with mentioning Dorn has never been about resetting the clock that FW has when it comes to making Dorn, simply releasing him. So every time you mention Dorn, or ask for Dorn, or even just put the word 'Dorn' in your post, FW resets the release clock. After my post alone the completed Dorn model won't be out for at least another 3.5 years. Wow, I'm a huge fan of the Imperial Fists and Dorn (I play an IF successor in 40k), but I have to say this model has left me speechless with disappointment. Its as though they arbitrarily decided to throw out interesting elements of his armor from previous illustrations (the massive eagle pauldrons, gasping faces on his kneepads, etc), then downplay some of his most iconic elements into mediocrity (the eagle on his backpack is so small, his the Voice of Terra looks practically mundane, Storm's Teeth looks about the size of a normal eviscerator), and worst of all gave him such a horrible pose. Maybe I'm an outlier, and I know for certain I'm biased, but I cant help but feel that design wise this is one of the worst primarch models Forgeworld has made so far. I mean comparing it to previous art works is so hopelessly disappointing. I did expect the eagle thing on his back to be bigger. Shouldn't the dead Marines near him be Alpha Legionaries? Rogal Dorn is simply amazing. Its 3 now. Soooo, anybody from the North of England going to the weekender fancy picking me one of this guy up? The fact he just stand there with a good old chainsword makes him the most badass primearch yet. will judge him when we see how big his chainsword really is...the eagle in the back is too small...like his pose. Now lets see what forgeworld will do with the price of him. Kind of poor. It's as if the elements were there for a better model, but it's just lacking in execution. I've seen better conversion based off of other models. Very nice model, i like it. 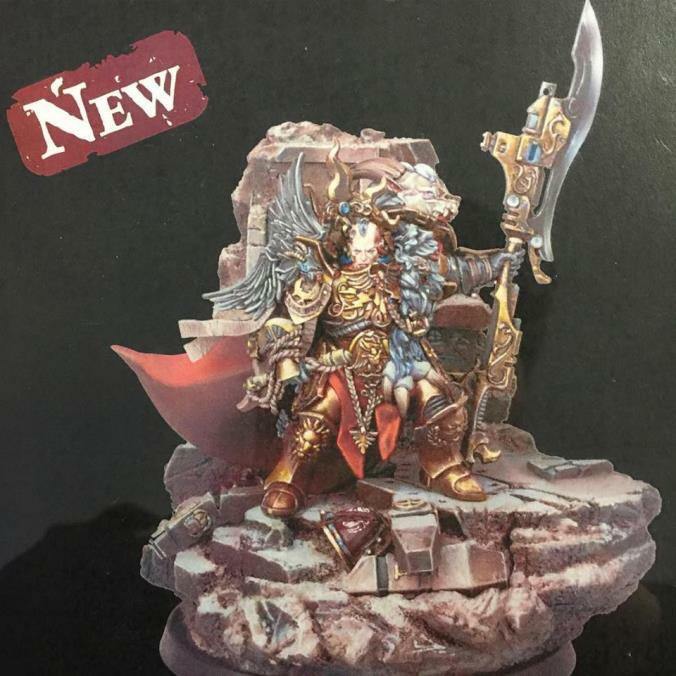 I think it can be the best primarch model released so far. The face is very very well done, it actually looks like a person and not some horrific doll (like most of the GW minis). The details are correct, not so cartoonish as some of the illustrations. The pose reflects very well the character of the lore character, stoic, tough, hard as a wall... That's a good thing. Really good. It shows also that GW is capable and knows how to make well sculpted and beautiful models. It would be really nice if they put all these talent and good work in making nicer and more beautiful miniatures for their regular lines, and step away from the damned "heroic-scale" nonsense (that means ugly as hell models). 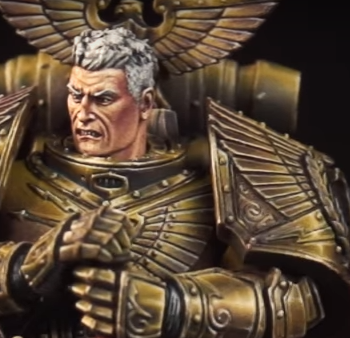 I like the details but overall Dorn comes across as being one of the blander Primarch models, only one step up on Guillaman. Wow. Great sculpt AND a solid paintjob too. And I know you IF players have been waiting a while. 6 full months longer than me waiting on my stupid decals. Must be satisfying.... I'm not salty, honestly. Dorn is lovely, except, as usual, he has a baby-face. Everything else is lovely, but I want to see the bare resin before passing judgement on the head. Didn't think this day would come. I like the stoic pose. Not every primarch needs to be frozen in a stasis field while in the middle of some dramatic action teetering on the tip of a pile of rubble. The face could definitely use some improvement and, as you said, it's been a relatively long running issue. Wish they would simply give us helmet options. Jack Flask wrote: Wow, I'm a huge fan of the Imperial Fists and Dorn (I play an IF successor in 40k), but I have to say this model has left me speechless with disappointment. Ketara wrote: Kind of poor. It's as if the elements were there for a better model, but it's just lacking in execution. I've seen better conversion based off of other models. You are allowed your opinions, even if they are wrong. Personally I love the model, I love some of the more rediculous details being toned down. The pose is great and fits my image of Dorn. Yeah, everyones got their opinions on it. Some folks like the Space Wolf sculpts. Some folks hate this. They're wrong. But they can have their opinions. I’m just kidding, don’t lynch me. Fantastic model, and you long suffering Imperial Fists players definitely deserve it. Needs a proper mustache though. 100% agreement from me. I have no idea what they were doing with this one. I think all FW Primarchs sculpts lack a Helmeted option. They are the ideal opportunity to give them really crazy and fancy helmets (But thats maybe my "always with an helmet" bias) ... as others, everything about the miniature is good... expect the face. EDIT: I correct myself, that face is exceptional. I still like helmets more, but the expresion and painting 10/10. After many controversial paintjobs, FW has show what they can do with this. I’ve asked the FW loot sharing FB group if someone can pick this up for me. Making Dorn my first Primarch model. The Imperial Fists aren’t even a legion I had much interest in before, that’s how much I love this model. I think it’s my favourite of the Primarchs. Personally, I dislike the majority of the Primarchs (either due to sculpt or pose, often both). This is one of the few I think is very well done. It's almost shocking to me that it's not wildly swinging arms in a circle leaping off the kneepad of a Titan, grimacing with weapons twice the size of his body. In a current aesthetic zone where GW is continually disappointing me with largely comically-overstyled stuff, this is a breath of fresh air. That being said, I understand that the overwhelming majority of GW customers/consumers/fans are not exactly "less is more" types...so I understand why some people will be disappointed. I think my general opinion comes form law enforcement/military experiences where the real bad asses aren't the ones wearing t-shirts and tattoos to advertise it. Yup, that face is great. Not sure how good it would have to be to get no criticism. So where did this Meme of Dorn with a mustache start? To be honest I like him more with a moustache but because I love facial hair, and some as stoic as Rogal Dorn always had the kind of type of personality that I attach to a good moustache. I believe it comes from the Bruva Alfabusa videos? I like the face. You can hear him saying "I'm not angry, I'm just disappointed". Also, it's cool that he's just got a bolt pistol and chainsword. 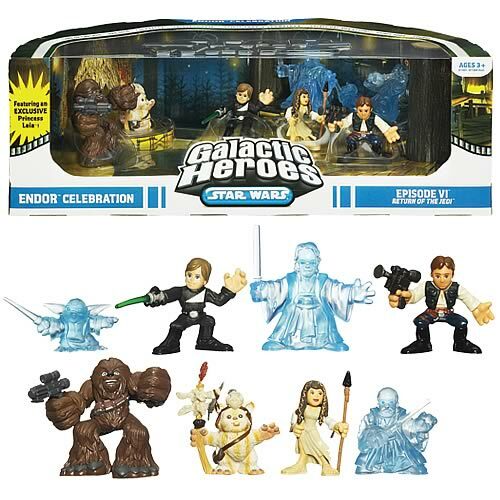 They are even of a size that looks like he could lift them, in a radical departure from almost all other minis, ever. A big but well-trimmed moustache does suit him, but not having a moustache is plainer and more practical so that's also a good option. I think FW could probably get away with making alternative head sets for the primarchs, featuring one helmet and one with facial hair. My body is ready. im super stoked. cant wait. any idea when he is going for normal release? Nah...Dorn is the kind of dude who shaves twice a day and thrice on Sunday. I have to disagree. Anything that moves away from Blanche garbage is an improvement. No need for all the ridiculous bling. Most of the time its stupid and impractical. I think the pose is fantastic as he doesn't look like he's dancing or fighting ghosts. He looks like a battlefield commander. Much like Creed. I think its one of the best primarchs yet. Vastly superior to Russ or Angron. Personally I think he should look a bit more youthful, but that’s more of a paintjob problem than a modeling problem. Eh i think russ and angrons pose works well for who they are. Dorn is a stoic man. as much as girlyman is also a tactician rather than a beat stick so both of them in a standing pose works really well. I wouldn't mind a bit more EAGLE but i think it looks fine. Hooray! Not only are all the people that have been patiently waiting (fnar) for Dorn now get him, he even comes with a free Warlord Titan base! The wooden grip on the bolter is a nice touch. Fantastic model. As a Templars fan, this model of our gene-sire is stellar. No, he's still pissed about Curze beating him nearly to death, so he's venting out on the 8th legion. 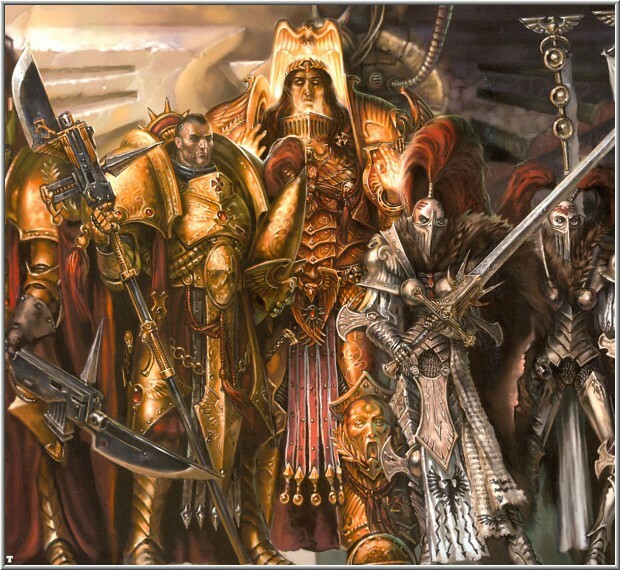 I would really love to see someone do a diorama where Dorn is shredded laying on the floor all mangled, with Curze crotch by smiling! I thought that it was Lolrus ivory from Inwit. Nice touch all the same. The linked converted Dorn is clearly Guilliman still, as he still has the Ultima on the torso, lol. I like this interpretation of Dorn - have we seen the Valdor model? I agree. 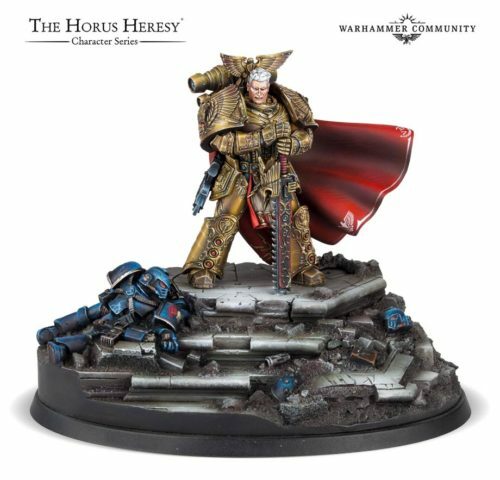 Rogal Dorn (alongside Horus and Roboute Guilliman) is primarily a commander, not a [/I]champion[/I], so the pose suits him. I quite like some of the other fighting poses, it's all in the context. Fulgrim looks a bit goofy on his own, but pair him up with Ferrus Manus as intended and suddenly that pose makes sense. Same goes for Leman Russ and Magnus. And I now hate John French even more. Didn't think that was possible! You need to tone down Blanche to get models that work in 3d. Blanche communicates clearly the wild energy and emotion of the setting, as though he were a madman living there. You'll need to tone it the flip down so that it has an internal aesthetic and balance and so that it can be reproduced by human sculptors in 28mm. He contrasts excellently with Guilliman, who also statically posed and modelled on Astartes armour, looks far more the statesman general than a warrior. His sword looks like the master chainsword, his boltgun looks like the bolter-prime, being a second ed bolter with 1st-Ed and 3rd-Ed elements. Love the pose but hate the gold. This is the only Dorn for me. Feth all the retconed jank. But that's NOT my problem with M. French...and Dorn. Just saw Dorn, and I must say he’s fantastic, except for one thing. His face is hilarious though, looks like a Rick and Morty character. 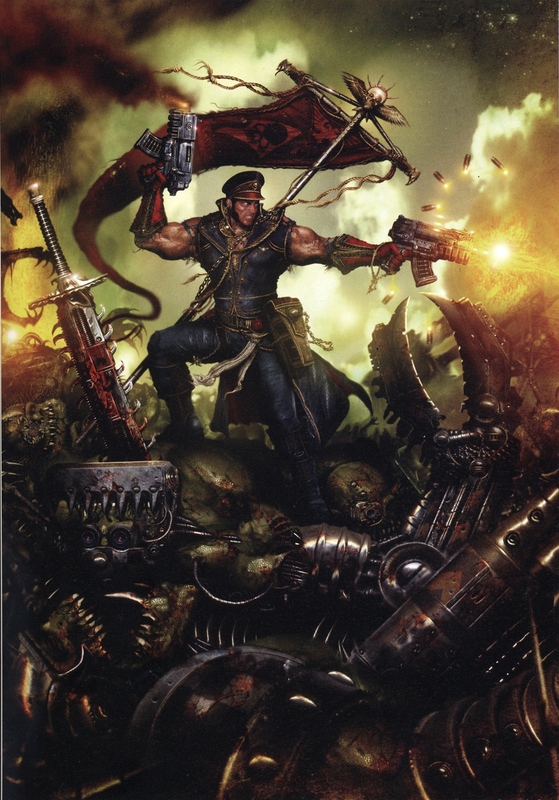 If memory serves it was in the Space Marine(epic1st ed) rulebook which had the original and best version of the heresy story (No fething smurfs or girlyman) again if memory serves it was a loooong time ago and beflre I discovered drink and all the good slaneshi stuff that messed with my memory. 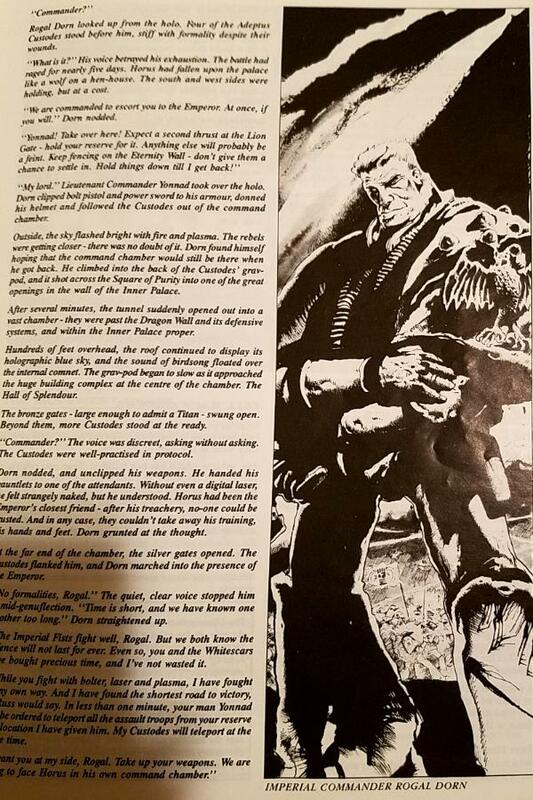 Guilliman gets more column inches than Dorn does in that 1st edition Space Marine rulebook, although we don't get a picture of him; Dorn and Horus are the only Primarchs pictured. Plenty of Ultramarines too, although part of their appearance is a two-page spread of a couple of dozen dead ones tied to the columns of a building. Conspicuous by their absence are the Alpha Legion and Raven Guard - the latter not having been invented at that point. And the Dark Angels were green. Not quite the original version - the location of Horus and the Emperor's battle was moved to Horus command ship (rather than the command bunker on the ground as described in Slaves to Darkness). Technically that edition of Epic was set during the Scouring - after Horus had been killed - although all of the flavour text was set prior to the siege of the Emperor's palace. I love the Lingering Shadow. Those figs are just wacky. Awful proportions. Unless they are Dwarf Ring Wraiths? Yeesh. Those are so, so bad. I am cringing. FW is all over the place. How can you have these follow on the tails of that incredible Dorn release? They need to just scrap the LotR stuff and focus on their own properties. I'm really disappointed with how amateurish these models look - their torsos are as long as their legs! It almost looks as if they sculpted the top half in the wrong scale, then realized that they would be too tall - then decided to give them dwarfy legs instead of starting over. A shame, because I really liked the Nazgul from the Dol Guldur sequences. Wow... he's... um... very fulgrimy. Well that’s....something. I really need some better pictures but he doesn’t seem, right I guess is the word I’m looking for? There’s just a lot going on on the upper half of that model. Edit: My God, why is that Shield Captain’s head so big?! What on earth is going on with that? Valdor is just bad and way, way too busy. Can't even focus on what I'm meant to be looking at. 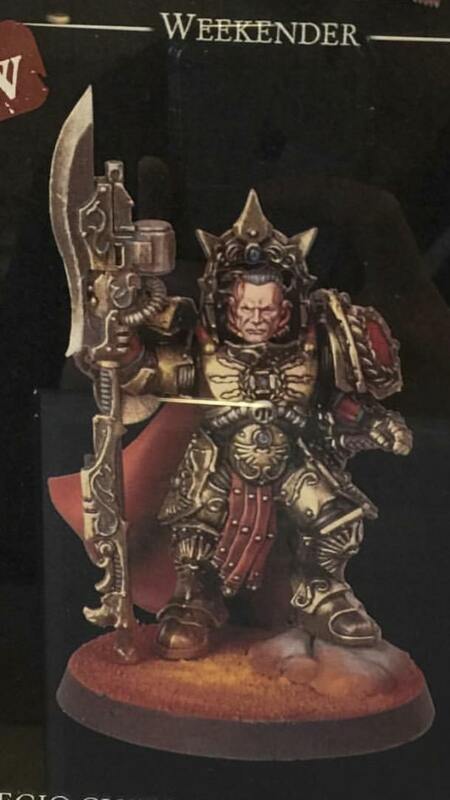 That's alot better and more of what I'd expect from a Custodes commander. The Valdor model is just way too Blanchey flamboyant for a Custodes IMO. YMMV. The Shield Captain is clearly modelled on an original Thunderbirds marionette. Nothing else could explain why the head is so big. As for Valdor... well they did say it'd be the most blinged out model to ever have bling. Valdor is a good model with too much chucked on top, I think. And I really wish his head matched his art in Inferno because I really liked that. I think he is the event exclusive. Artemis isn't really a boy's name either though, is it? And yes, why is that Shield Capatain's head so big? Can we hold out hope that it's just a bad pic/bad angle/etc? Artemis is definitely a female name, going by It’s Always Sunny In Philadelphia. I looked Constantin up after Azraels comment and it’s apparently a Romanian and French masculine given name, which can also be a surname. I think Azreal13's point may be that Constantin isn't looking particularly masculine, maybe? I don't think that's how light/photography works unless the pic is taken through a fish eye lens or door peep hole. Maybe Fulgr... 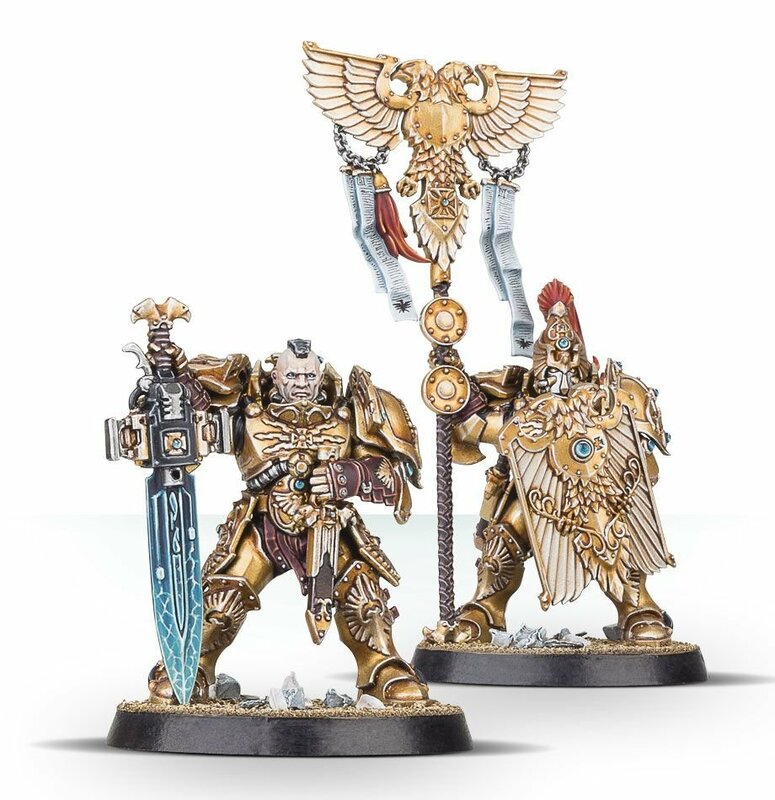 I mean Blanchey Valdor and Big Head Mode Shield Captain along with Intro to 3D Modelling 101 Space Wolf Praetor are the new normal? Oh, possibly. He does have a bit of a point, if so! Sometimes these things go right over my head. Honestly, a wit like mine is wasted on you lot! It's the Guardian Spear blades that are ruining it for me. Although, TBF, androgynous is probably more accurate than feminine, but either way, not the visage I'd expect from one of the hardest blokes in the galaxy. I want Valdor very badly. Someone get it and gak it to me. I'm glad you pointed that out. I already had the wikipedia page for the Roman Emperor copied to link into a response. Yes, beyond the flamboyant pose with way too many Blanche style embellishements, his head because of the paint job looks like a cross between Schwarzeneggar's Mr. Freeze and Culture Club era Boy George. Wait... is that another joke? I've cranked up my inneundar to max gain after the last post. Is that supposed to be valdor? Huh. The weapons are the only bit of those that jumped out at me as being appealing. I'll reserve judgement on Valdor though, FW have put out a lot of character models of late that looked like arse in event pics but turned out real nice once I saw decent images of models painted by people other than their retainered guy(who's not bad, per se, just not to my taste). EDIT: Like, why on earth would you choose a reddish-brown tone for the stonework on the big OTT base for a model that's mostly gold shaded down to a reddish-brown and a dark red cape? It makes him blend in at the edges especially at the top of the model, and then you have *just* the furry-feathery-wotsit bit in a blue-grey so it stands out far too much and cuts the model's silhouette in half. I take it back, it is bad. Valdor looks like he's overcompensating with that spear and the Shield Captain looks like a bobble head lol. Valdor isn't too bad I suppose, it's all personal preference. I hope the pic of the Captain is edited or something though because that looks like a joke. Yeah, not being able to see his silhouette properly is really making him kinda hard to look at, definitely not helped by the painting decisions pointed out by Yodhrin. 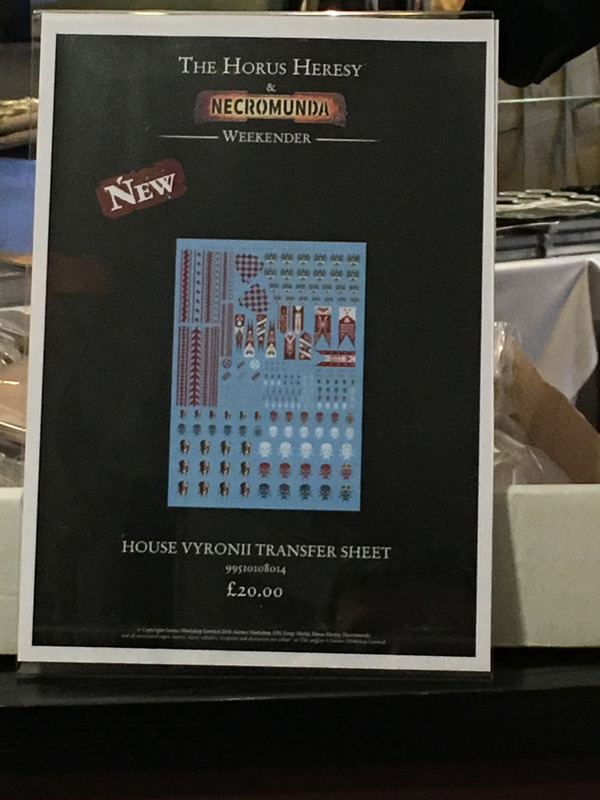 Battlebunnies also showed that there are Guardian Spear upgrade packs, Space Wolf upgrade packs and...House Vyronii transfers for sale! The spear/glaive is short and stubby too. I'm pretty sure he's supposed to be another Squat model. Brave move by GW to include Squat Custodes in the game. Dammit, now that you guys said something about Constantin being a girls name, I can't unsee the female looking head on the mini. Cabeza Grande the Shield Captain.... that has to be an issue with the photo. Wait. Wait wait wait. Are these the ones? Yay! Special spears for the Custodes. Been waiting a while for those. I actually quite like valdor, the claw and trophy shoulder I need a better pic of to judge. Vyronii transfers available? Looks like another clock broke! Maybe it's the paint style and the photograph of a photograph, but Valdor but It's what I'd expect of a great triumphalist painting rather than a miniature. It's more like one of those ostentatious paintings of Napoleon I, designed to feed his ego. 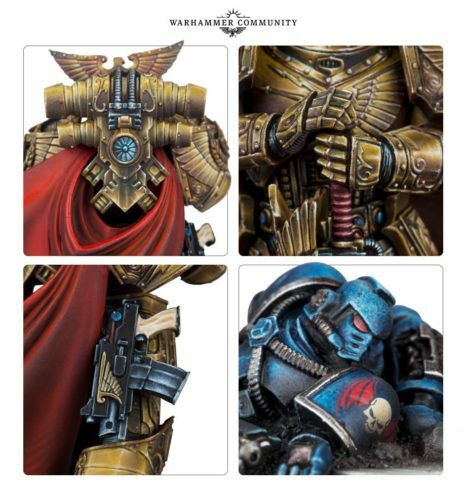 Which is actually what I'd expect from the Custodies, they are supposed to have all sorts of symbolism and hints to their past deeds on the armour are they not? Yea I like it, not as much as I like Dorn. Ooh, they finally did them decals? Did they get rid of the previous artist and get a new one or something? Where where where where where x infinity! Personally I think the Valdor mini is amazing. Could be my first HH character model. Same. It is actually interesting looking model, and not just another identical looking dude in golden armour. The claw and bullhead just look a tad too big, but otherwise it looks pretty excellent. I'll be getting Valdor, but I need to see more angles before I decide how badly I need Valdor. After Dorn (who is perfection) I'm just left kinda meh about Valdor so far. I like that he is just not another frowning grizzled macho dude. I really liked that about the art, but I don’t like the models head. I'm gonna happily swim upstream here and say that Valdor is a spectacular sculpt. Sure, he's blinged out...because he's the leader of a very blinged out faction. *shrug* I think some opinions will shift once we see some other painting approaches to the model. I'll wait for a better picture of Valdor before weighing myself. For me, the problem with the Shield Captain is not that the head is so big. The ears are the problem! He looks like dumbo! And those special spears will have rules for 40k? Or are only HH? HH only, for the minute. The Heresy Era stuff will be getting 40k rules, but how much of it we don't know. We may know tomorrow though? They’re tubes, or the bottom part of the “ears’ are at least. IS THIS REAL!??!?? SOMEONE BUY ME TWO THREE PLEASE. RIGHT MEOW! BrookM wrote: I'll wait for a better picture of Valdor before weighing myself. You're beautiful BrookM no matter what the scale says! Don't let Forgeworld's svelt models fat shame you. gorgon wrote: I'm gonna happily swim upstream here and say that Valdor is a spectacular sculpt. Sure, he's blinged out...because he's the leader of a very blinged out faction. *shrug* I think some opinions will shift once we see some other painting approaches to the model. It's an opinion just like the negative ones. If you like him, go wild and buy/assemble/paint him to your heart's content. I suspect he'll be a polarizing model much like the Blanche style illustrations he's clearly influenced by (and I also suspect the opnion lines will be drawn similarly to those on his art style). See my sig, join the group, trust to luck! I honestly don't know if anyone in said group is attending, but worth a shot? Oh, don't worry. Already joined, and have joined the tens of Americans begging for a Valdor. Hopefully the Café will alleviate the need for trans-atlantic transactions on some exclusives! Both of those look uper generic. 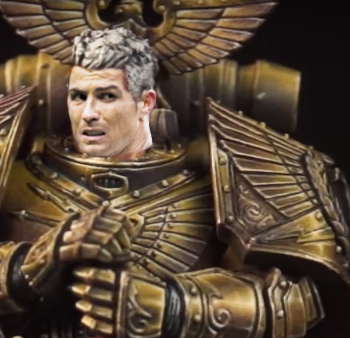 As someone pointed out, you can pretty much assemble guy looking like that from the Custodes plastic kit.